Use Vita-Lite full-spectrum lighting in your dental office or lab to accurately decipher colors for prosthetic tooth matching and more. Color is reflected light. No matter what color-matching method you use, you need the proper lighting for the tedious and time consuming work of matching a bridge or crown. Vita-Lite light bulbs are the best full spectrum light for color matching - Neutral white light 5500K, 91 CRI. Others at 5900K or above have blue tone and distort true color. 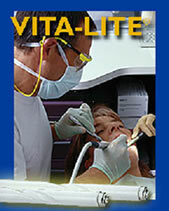 Vita-Lite Full Spectrum Light Bulbs Circline Bulbs are also available. Excellent for all types of medical lighting for labs, exam rooms, hospitals, etc. NEW LED Natural Lighting Fixtures.